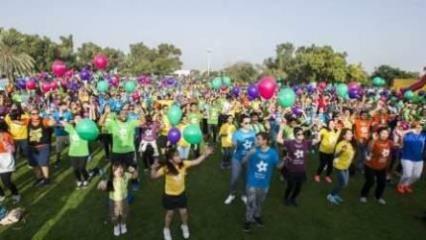 'Walk the distance and make a difference' was the message given out at the Dubai Cares' annual Walk for Education at the Dubai Creek Park on Friday morning. An enthusiastic crowd of 15,000 people from all walks of life gathered at the park to take part in a 3-km walk in solidarity with millions of children and young people in developing countries who walk long distances everyday (an average distance of 3km every day) to get to school. Compared to previous years, this year's ninth edition of the Walk for Education saw an increase in participation among corporates and educational institutions in the UAE. Traffic around the Creek Park was diverted for a couple of hours as the crowd marched on the road outside the park. A live band was stationed at the traffic signal in front of the main gate of the park, playing foot-tapping numbers to buck up the people and encourage them to brave the heat and walk for a cause. A number of food stalls, fun activities such as painting workshops for kids, live band and a lively DJ kept the crowd entertained inside the park. Not only people had fun by staying active and walking, but also got a taste of the struggles experienced by some children in reaching school every day. Teacher at Emirates International School, Jumeirah, Lina Charif, who was present with about 15 of her students and their parents at the walk, said: "We have been covering topics such as global citizens in school with our Year 5 students and they researched on how children around the world were less fortunate than we are. They researched about the ways to help and that is when they learnt about this Walk for Education by Dubai Cares. So they decided to take action and participate in the walk along with their parents. Their parents have also volunteered for the event so they can lead by example and spread awareness. Around 120 students from Westford University College, Sharjah, burst into a flash mob just before the walk started, putting their best step forward to create a buzz about the walk. The students chanted slogans and held placards with sayings from famous leaders on the importance of education. "We stand for education and firmly believe that it can bring about a sea change in the world," said Zawahir, associate dean at Westford University College. The community engagement initiative was conducted in line with the Year of Zayed 2018. Commenting on this year's remarkable turnout for the Dubai Cares Walk for Education, Tariq Al Gurg, Dubai Cares CEO, said: "We are extremely impressed with the exceptional support that members of the UAE community continue to demonstrate towards the noble cause we support. The generous support we receive from all corners of the UAE will certainly help us extend the scope of our efforts to reach as many children and young people as possible in developing countries. Dr Abdulla Al Karam, chairman of the board of directors and director-general of the Knowledge and Human Development Authority (KHDA) said: "I am extremely happy to participate every year in Dubai Cares' Walk for Education. The event is getting better every year as I see an increase in the number of both participants and organisations supporting this initiative. I am also very delighted to see more kids this year walking and having fun because this is what the event is all about. This event is certainly the best way to start the weekend. Al Tayer Group and The Kindergarten Starters were among the first organisations to sign up, confirming the participation of 2,100 staff and 1,414 students and staff, respectively. Dubai Cares' other supporting partners for the Walk for Education 2018 included Arabian Radio Network (ARN), the Dubai Corporation for Ambulance Services, the Dubai Municipality, Dubai Police, the Dubai Sports Council, ExpatWoman, JK58, Hills Advertising, ITP Media Group and the RTA.